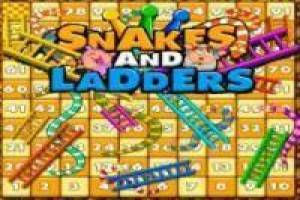 Play classic game of snakes and ladders in our virtual boards that we offer in the games. You can play with 2 players or more, you can also compete against the CPU. Roll the dice and move boxes to reach the goal, the uniqueness of this game is that if you end up in a box stairs ascend to higher and go down if you end up in a box of snakes. Good luck!. Enjoy the game Ladders and Snakes, it's free, it's one of our table games we've selected.